The autonomous drone system developed by Lakeside Labs and U Klagenfurt is one of «15 novel ideas for 2015» featured by the WIRED magazine. 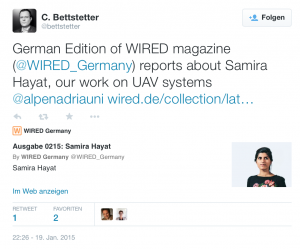 Max Biederbeck interviewed Samira Hayat, PhD student in the research team. Here are some extracts from this interview translated into English. Photos by Gene Glover. I learned at the dentist what people think about my work. The scene took place during my last visit home in Pakistan. My father had accompanied me to the doctor’s office, and while I was treated, he began to tell. “My daughter does research in Europe,” he told the dentist. “At a university in Austria, and she works with drones.” When the dentist heard the last word, he played his surprise with a laugh and said, “I hope she does not work for the Bad.” Phrases like these accompany my work. With my chosen profession, I’ve broken some taboos. 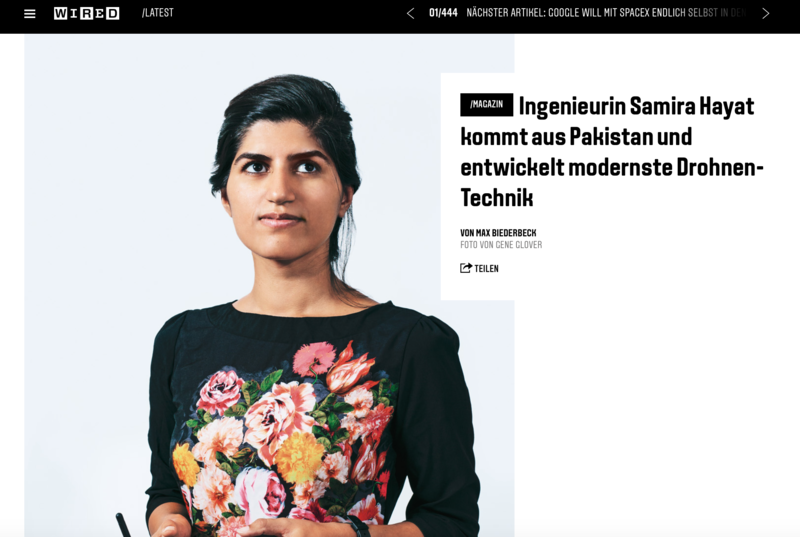 My friends at home gave me the nickname of “rebel.” It really was a daily struggle: A Pakistani woman who is an engineer and researcher at drones; this is exceptional. Instead of getting married, I moved to Europe, because of the profession. Maybe my friends are right with the name “rebel”; otherwise I would not have come this far. I like the title anyway. I have been a researcher at the University of Klagenfurt since 2012. At the Institute of Networked and Embedded Systems, we develop autonomous and self-organizing systems for civil purposes. On the one hand, we develop UAV systems to be used in emergency situations or accidents. A second application would be a commercial one, namely to use drones in automatic delivery services. We are still at the very beginning of the research in this service sector. It would be conceivable as to bring drugs to patients in the shortest time. UAVs could deliver medicine around the clock in a completely autonomous manner. What we develop in Klagenfurt is simply useful. I am aware of the fact that terrible things can be done with drones, and the word alone already connotes negative. But you can also use drones to help people in emergencies. Or for commercial purposes. We can transform something that makes us fear into something that serves our well-being. The full article can be read in the January issue of WIRED as part of a feature on Innovators and Masterminds. WIRED+ members can read it online. © 2015 WIRED Germany.